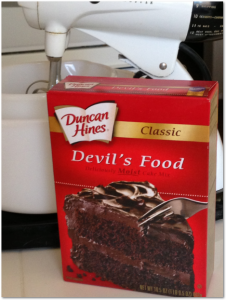 Two of America’s biggest baking brands are named after people – Betty Crocker and Duncan Hines. The former was invented by a marketing department (and whose story I have previously told), but Hines was real person. However, he didn’t have the credentials you might have expected to be the face of such a famous food brand. He wasn’t a chef or even a keen amateur baker. He was a traveling salesman for a printing company. What’s wrong with that you might ask until you hear the ingredients of that particular cocktail. It’s made from the juice of a watermelon pickle, a whole egg, cream, gin, grenadine, orange-blossom honey, and lime juice! Yet Hines was for a while America foremost food critic. How did that happen? The clue was his job. As a travelling salesman Hines did just that – he travelled. He averaged 40,000-60,000 miles a year and when on the road, he ate most of his meals in restaurants and diners. 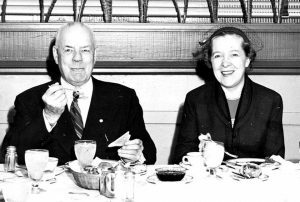 What’s more he and his wife, Florence, loved to travel on weekends and then to they often chose to eat out. After eating all those restaurant dinners and lunches across the country and across the years, Hines had discovered where the best places to get a meal were and where you should avoid. He and Florence had an idea they start compiling a list of recommendations of their favourite restaurants in various cities and towns around the country. They sent it to friends as Christmas gifts. 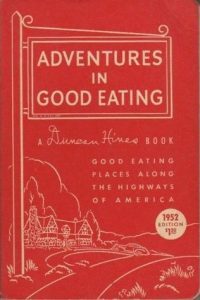 His friends loved it so much that in 1935 Hines signed a publishing deal and turned his travels into a book; “Adventures in Good Eating. Book”. He became a best seller. One of the reasons for its success was at that time in the United States, there was no interstate highway system and only a limited number of restaurant chains, except for those in large, populated areas. Therefore, travellers depended on meals at local restaurants and a book of honest recommendations was welcomed. In 1938 he released a second, companion book; “Lodging for a Night”. This reviewed hotel and motels and suggested where travellers might like to stay. In the 1940s, Hines the started a newspaper food column, “Adventures in Good Eating at Home”, which appeared in newspapers across the US three times a week (on Sunday, Tuesday and Thursday). The column featured restaurant recipes, adapted for home cooks, that he had collected during his nationwide travels. Hines was now one of the country’s most trusted food critics. 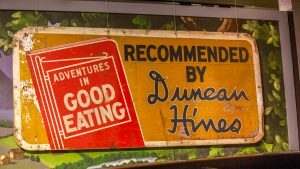 A roadside sign advertising Duncan Hines’ Adventures in Good Eating is on display at the Kentucky Museum at Western Kentucky University. Moving from recipes to products was therefore a logical next step, and while Hines is most famous as a cake-mix, the first foodstuff bearing his name was actually an ice cream. The Lehigh Valley Cooperative Farmers dairy of Allentown, PA, started churning out Hines-branded ice cream in the summer of 1950. The treat was an instant success and helped convince Hines that licensing his name was a viable business strategy. In 1952, Duncan Hines made his first move into bakery products introducing Duncan Hines’ bread in partnership with Durkee’s Bakery Company of Homer, New York. A year later, Hines sold the right to use his name and the title of his book to Roy H. Park, forming Hines-Park Foods, which in turn licensed the name to several food-related businesses. The cake mix license was sold to Nebraska Consolidated Mills in Omaha, Nebraska, which developed and sold the first Duncan Hines cake mixes. In 1957, Nebraska Consolidated Mills sold their cake mix business to Procter & Gamble who expanded the brand to a national market, adding more related products. The mixes were a huge success and now almost every American knows his name but few know the back story.